Question: Can the acids in lemons and other fruits register electricity to a voltmeter? 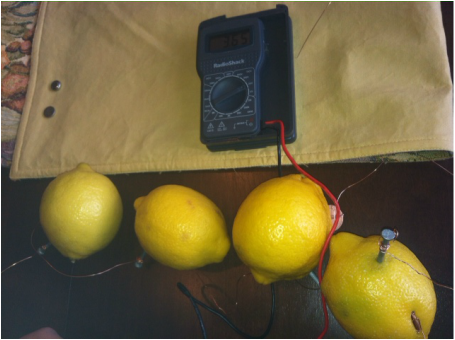 Hypothesis: I think a lemon and other fruit can register electricity. The acids produce electricity. This will happen from a chemical reaction with the acid and two metal electrodes, forming a full circuit. Wear latex gloves, goggles are optional. DO NOT squeeze the lemons or jab the nails or clips in. It can get into your eyes, burning them. 3. Stick nail in fruit. This is now your negative electrode. 5.Stick penny in fruit. This is now your positive electrode. 6.Insert wire to voltmeter. You should get a charge of 0.80-0.95 volts. If not try again with another fruit. 8. You can try again with a different fruit! Just redo the steps as you did with the first fruit you picked. When the acids react with the 2 metals, it makes a positive and negative. 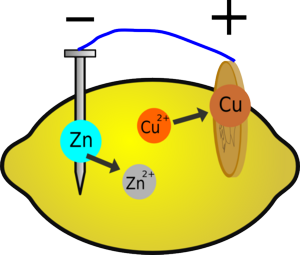 Your zinc electrode is positive, and copper is negative. The acids in the lemon are similar to a battery. Do you know why they call Duracell " The Copper Top battery"? That is because it is similar to ours. They use copper as a negative metal in their battery. I accept my hypothesis. Acids in some fruits, mainly citrus, can produce enough power to register a circuit. William is 10 years old. 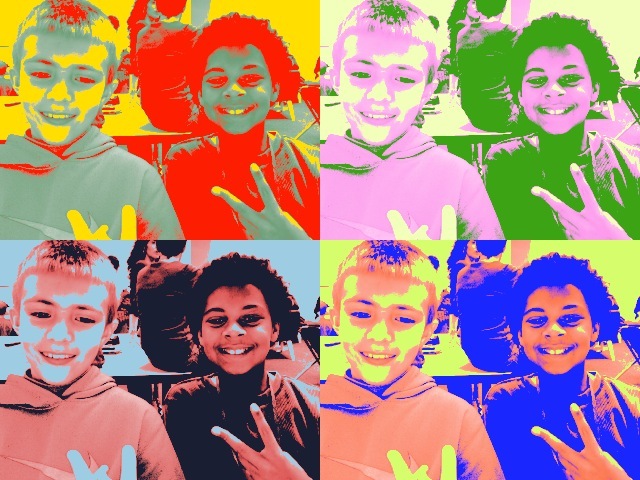 Science is his absolute favorite subject and like the other scientist, Cassidy, he enjoys playing Minecraft,making movies, and playing with and collecting LEGOs. He also plays basketball. Cassidy is 11 years old and LEGOs, Minecraft, and moviemaking. Science is a favorite of hers and likes Selena Gomez music.